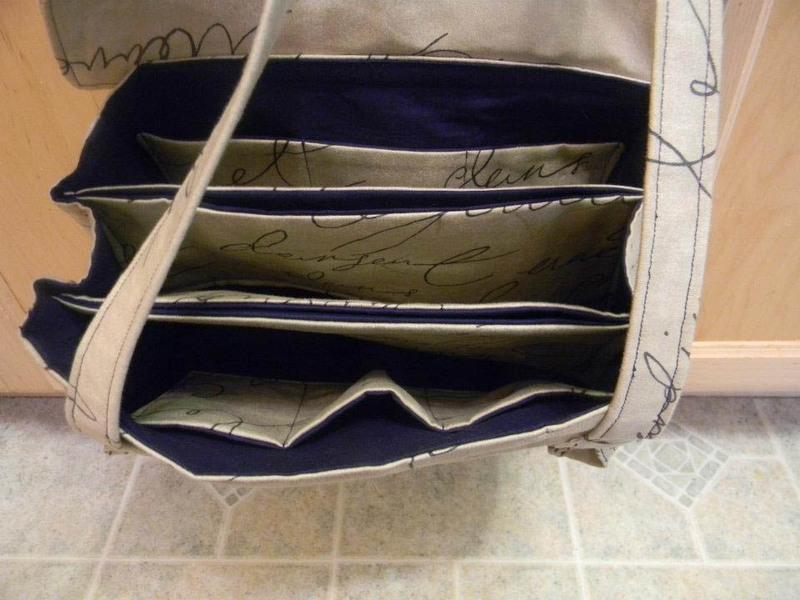 The instructions for this bag are OK and I would not suggest making it if you are new to sewing. There are several things that I have changed and some tips for I want to share. The pattern says to use Peltex and iron-on fusible interfacing to hold it in place. First I found that it is almost impossible to get the Peltex centered exactly so that it is inside the seam lines and second I found that it was just too stiff for my liking and was very hard to sew. I made this purse for a friend’s birthday and she says she loves the purse being stiff. 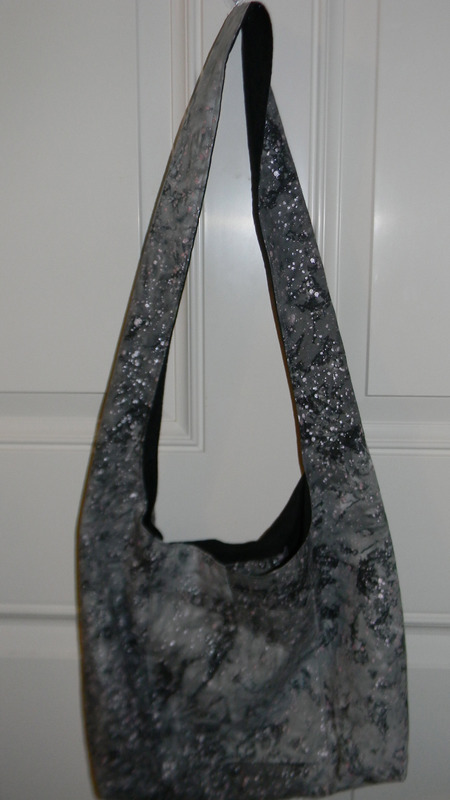 This purse was made with cotton fabric 44″ wide and it took almost 3 yards for the whole purse. I also added a pocket on the outside for a cell phone. Next was the purse I made for myself. I chose a 60″ wide fabric from Wal-Mart that looks like leather. I also used a black cotton 44″ fabric for the lining. I decided to throw out the Peltex idea and looked for a stiff iron-on interfacing. The one I chose was Pellon 809, however they didn’t have any that didn’t have huge wrinkles in it so I decided on Pellon Craft Fuse. I found that this was not a great choice. When turning pieces inside out the wrinkles tended to stay and I could not iron the leather type fabric. I wanted the purse a little smaller for myself so I decreased the width of the purse by 1″. This was an easy fix by just folding the pattern pieces for the main panel, divider pieces and flap 1/2″ at the fold line. Then I had to remember to cut the bottom pieces 1″ shorter. The next change I made was to add a large pocket on the inside front and divide it by sewing pockets for my phone, iPod and credit card holder. I also left out putting the zipper into one of the inside dividers. Now onto the interfacing. I did not apply any interfacing to the flap, I should have at least applied it to one of the pieces. I did not put any on the handles and that was a good choice. I only put interfacing on the lining piece for the sides of the purse and it was perfect, especially for tacking the dividers. I also left out the interfacing for the front design items and it made them much easier to sew. The biggest mistake for this purse was that I sewed the inside pocket for my cell phone/iPod to close to the top of the purse and it pulls the front of the purse down. Lesson learned. The third purse I made was for a friend. She chose a heavier weight cotton from the home decorators fabrics. It was 60″ wide and I used a navy 45″ cotton for the contrast. I purchased 1 1/4 of both fabrics to make sure I had enough. On this purse I used the Pellon 809 and like it the best. I lined the flap with 3 layers and think it worked out great. I also added an additional large pocket on the inside back and divided it into 3 sections. I also sewed the pockets farther from the top of the purse. 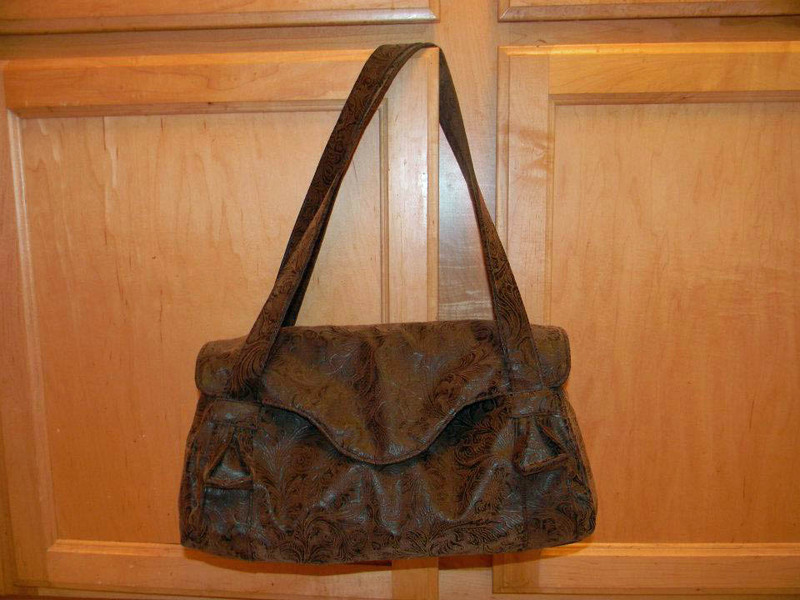 The next big change I made while making this purse was when I joined the lining and outer shell. Instead of sewing them together and turning it right side out through a hole and then topstitching, I folded the outer purse top down 1/2″ all the way around and did the same with the lining. Then I just put the lining into the purse and topstitched all the way around. This alleviated the problem of wrinkling and helped since I had added the two inside pockets. 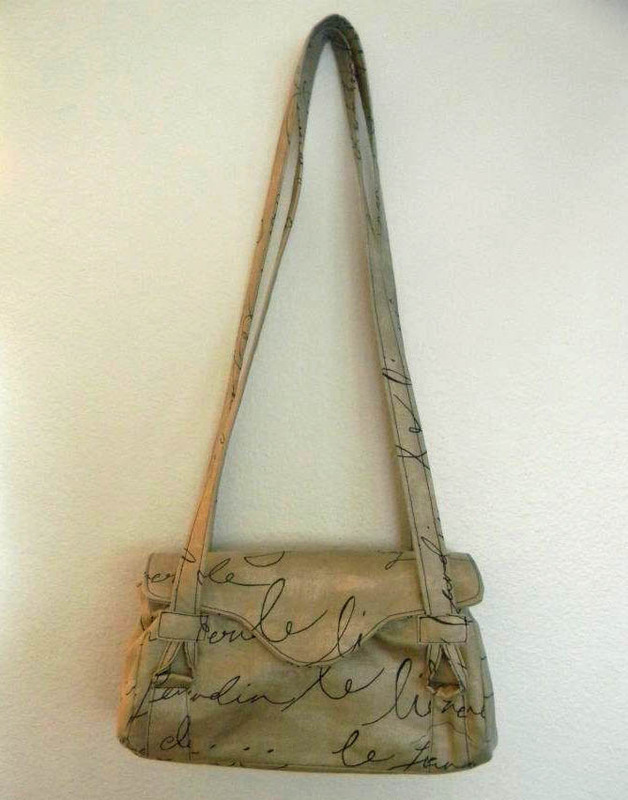 My friend wanted very long handles on this purse so she could put the handles over the opposite shoulder, they are approximately 50″ long. Since this was a cotton fabric I decided to put the interfacing on the handles. I think you could do the handles with or with out interfacing as there are 4 layers of fabric. It just depends on whether you want a stiffer handle. The big lesson learned on this purse is to finish the front and back panels and attach to the bottom. Then complete the flap for the purse. Place the flap where you think you would want it to close and then mark for the female part of the snap and install the snap. The flap on this purse lays to close to the handles and makes it a little harder to close. 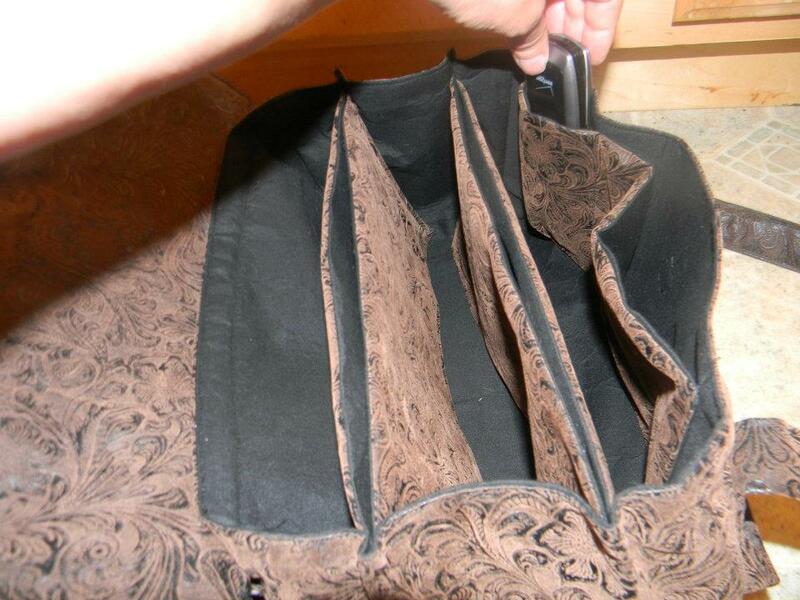 One thing I did do on all 3 purses was to use a small circle of Peltex behind the snap pieces. This will give the snap more stability and won’t allow the metal to work its way through the fabric. I have two purses that this has happened to. 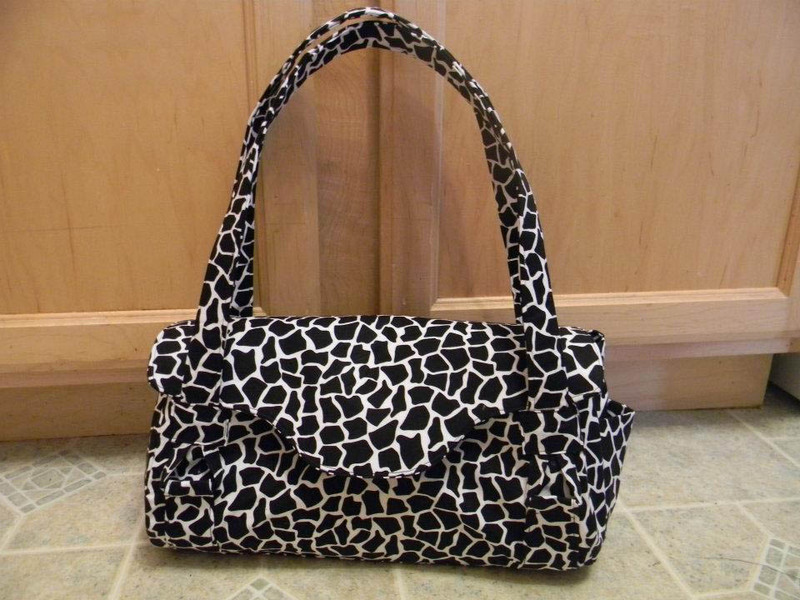 This entry was posted in Sewing and tagged pattern, purse. Bookmark the permalink.